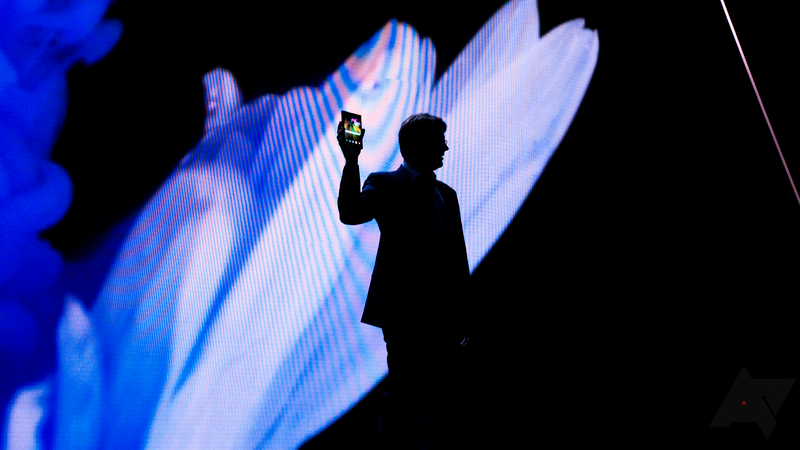 So far we know only bits and pieces about Samsung's foldable phone. At the tech giant's recent developer conference, it revealed a first glimpse at the device's two displays — one a 7.4-inch foldable screen, and the other a 4.6-inch display that is active when the handset is folded. During that conference, Samsung Mobile CEO DJ Koh also noted that the smartphone would arrive within the first half of 2019, and that the company planned to ship a million devices within the year. Now, the Yonhap News Agency in Samsung's native South Korea has reported a few new details, including a March release date and steep retail price. These details, it's important to note, are not substantiated, so it's best not to set any concrete expectations of the device just yet. Still, the reported information falls well within the realm of possibility. The South Korean publication reports that the phone, which sources call the Galaxy F, will debut in March, about a month after the next Galaxy S launches (likely at Mobile World Congress). The Galaxy F will reportedly command a hefty $1,770 price tag, and debut alongside a 5G version of the Galaxy S10, which will no doubt be priced at a premium as well. The Galaxy F itself will not be 5G-compatible, though — which is probably merciful. One cringes to think of the cost of a handset with both futuristic enhancements. While there's already abundant cynicism regarding whether consumers desire a foldable Android tablet in their pocket, this alleged price tag brings the question of who will buy the Galaxy F into sharper relief. Close to $2,000 is a pretty substantial gamble on an unproven form factor. Only time will tell, but if the phone does debut at $1,770, Samsung might need to argue that the smartphone can do more than just make multitasking easier.